We’ve never been responsible for a septic tank before. In case you’re not familiar with such a beast, it’s basically a big hole in the ground into which goes everything that goes through us. Plus the washing up water, laundry water, shower water, etc. It’s a bit grim. Well, it’s not, because luckily our tank is healthy… but it is. 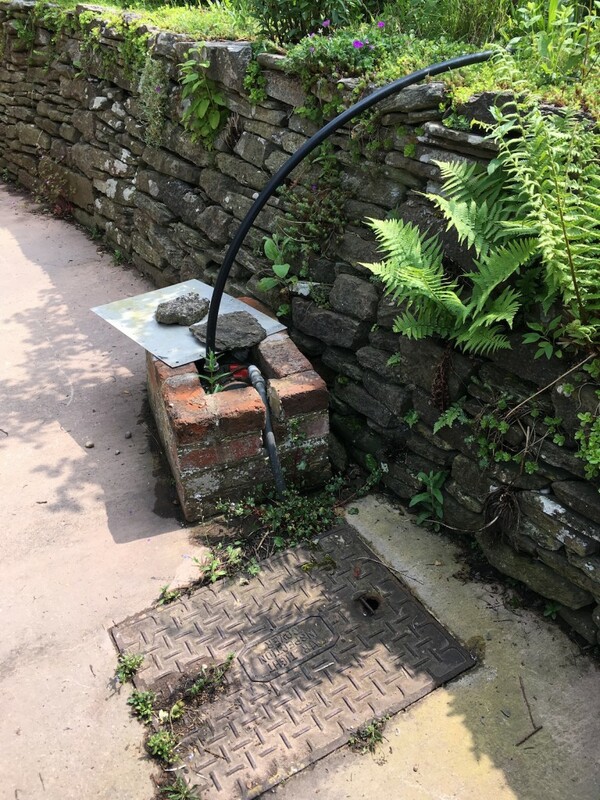 Normally, your waste will drain away into your septic tank, then the septic tank will do its thing (more on that shortly), then it drains away downhill into a soakaway. The house itself is in a dip at the bottom of the rise of the garden, about 12 feet off the road. So there’s no downhill for our waste to soakaway to. It’s highly illegal (thankfully) to drain effluent into public water courses or drains. So what’s going on here? Our tank system is pretty old, and a bit awkward: there’s a mechanical pump operated by a switch in the Rayburn Room, which means we have to remember to pump the tank every few days. We’re obviously going to replace this with an automatic system in the next year or so, but for now it’ll do fine. …who knows where? At this point, we’re not entirely sure where the soakaway is, but we have our suspicions. The good news is, there’s no horrifying, B-movie-style bubbling and no smells, so wherever it is, it’s healthy. The bad news is, we really will need to replace the system – or at least upgrade it – at some point. Preferably sooner than later. We heard a rumour we may be able to claim it on the buildings insurance, so fingers crossed. The tank itself is pretty cool though. We had a chap out to empty it and take a look, and according to him it’s in good condition and healthy. We have nothing immediate to worry about, which is somewhat of a relief. Since then, I’ve been learning about septic tanks. Many, many homes in rural areas rely on septic tanks because it’s just not possible to hitch us up to the public sewage system. Newer tanks are bottle-shaped and made of plastic, buried underground; older ones (which we have) are usually large rectangular boxes of brick, stone, or concrete, buried underground. It’s a simple waste water treatment works. Waste material – charmingly known as “sludge” settles in the bottom of the tank for natural bacteria to digest. It builds up, so we have to have it emptied every year or so to make sure it continues to work properly and to prevent the soakaway becoming choked. Then the grey water drains off into a soakaway, usually a pit filled with gravel. They tend to be quite big, so are a massive pain in the backside to replace or work on. Also, it’s very expensive. We need to find where the soakaway is to check the discharge is light grey and doesn’t include any solids. I’ve discovered that expensive, posh toilet roll is a no-no — it doesn’t break down easily, so can block the tank. Bleach in anything but tiny quantities is also a no-no, as is antibacterial cleaning stuff, because it kills the friendly bacteria in the tank. And chucking cooking oil down the sink is a bad thing, because that can solidify and cause blockages. We need to keep all this in mind when we build the new kitchen extension… but for now, everything seems to be working beautifully.